574 couples took a part in collective and itsbat marriage which are facilitated by Jakarta Government on New Year's Eve.
" 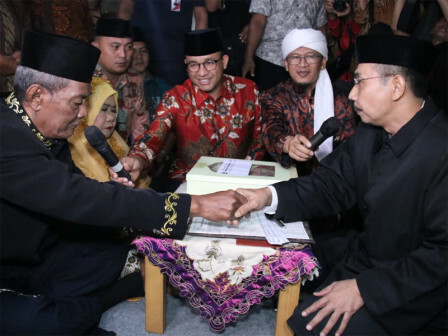 Thus this sacred and beautiful moment will be easily remembered every year"
Collective and itsbat marriage events were attended by Jakarta Governor, Anies Baswedan as a witness to marriage and Aa Gym who give marriage advice and tausiyah. Anies said, all people in the world celebrate New Year's Eve. According to him, this marriage event becomes a moment that will be always remembered. "Thus this sacred and beautiful moment will be easily remembered every year," he mentioned at Park and Ride Thamrin 10, Jalan MH. Thamrin, Central Jakarta where the collective and itsbat marriage took place, Monday (12/31) night. He also prayed for collective and itsbat marriage couples to be able to build a sakinah, mawaddah, and warahmah family. "Not only to build a good family, but I want all couples to participate in realizing a harmonious, peaceful, and respectful environment," he conveyed. For information, this event wa s also attended by Jakarta DPRD Deputy Chairman, Mohamad Taufik; Jakarta Secretary, Saefulah; and Jakarta TP PKK Head, Fery Farhati.